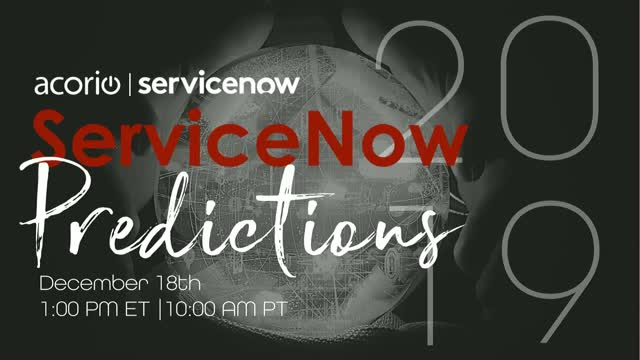 On Tuesday, December 18th, 1:00 PM EST, 10:00 AM PST, join our panel of 6 ServiceNow enthusiasts as they share what they're looking forward to and what trends they see on the rise in 2019 and beyond for ServiceNow. - Global Business Services... and more! Learn what trends HR leaders are talking about in 2019 with results from Business Forward's Annual HR Leadership Survey - then be a pioneer of those strategic initiative trends. Business Forward and Acorio executives will walk you through going beyond the "imagination" and show you how to make real changes with the power of ServiceNow's HR Service Delivery platform. Just getting started with ServiceNow? Whether you're about to implement the platform or still in the midst of researching, this webinar will introduce you to the innovative platform, what it's made up of, and how to get started on your ServiceNow journey. Learn how to build your roadmap, staff projects, plus find out tips for success, from Organization Change Management (OCM) to governance, and rolling ServiceNow out to your company. The first of its kind ServiceNow exclusive insight report includes all new original research providing industry benchmarks on the tactics, challenges, priorities, KPIs, and budgets shared by ServiceNow platform owners and executives across the globe. Join Acorio's CEO, Ellen Daley, and VP of Strategic Marketing, Meghan Lockwood to learn about the ServiceNow findings. Join our ServiceNow experts to find out strategies to help you start off 2019 on the right talk - from quick wins to proving ServiceNow's ROI. Look back at 2018 and ask yourself, how effective was my roadmap? In what ways could it change to align with my companies goals for ServiceNow? In this webinar, we'll be discussing trends we see from our clients, different use cases to set yourself up for success for the long-term, plus tips on how to communicate the business value of ServiceNow. On Thursday, September 27th, 1:00 PM ET, 10:00 AM PT, we've got an expert panel to discuss London. Get up-to-date with new features and figure out your next steps. Join Ken Michelson, VP of Platform Solutions, Marci Parker, VP of Client Delivery, Meghan Lockwood, VP of Strategic Marketing, Johnny Walker, ServiceNow Architect, and Michelle Bautista, Presales Solution Architect, as they present London's Calling: ServiceNow Experts Share London's 5 Most Compelling New Adds. On Tuesday, August 21st, at 1:00 PM ET, 10:00 AM PT, join Carleen Carter, Acorio's Director of Technical Consultants and Solutions, as she presents The Software Asset Management Landscape is Changing: Here's What You Need to Know. This panel discussion will feature leading experts from various departments inside Acorio, bringing tactical experience and strategic vision to help you guide your ServiceNow journey today. Learn from Acorio’s hundreds and hundreds of successful go-live’s – and pick the experts’ brains about their experiences in the ServiceNow trenches. Get the rundown of different audiences for the CMDB and how to achieve each of their objectives through out-of-the-box products. The Executive Corner: Strategies to accelerate your transformation to world-class Employee Services. Knowledge18 is just weeks away and it’s time to start preparing. Join Acorio’s Experts on a panel discussion on what to expect at this once-a-year conference. How can ServiceNow transform your HR Service Delivery? Start simplifying HR processes, reducing time spent on routine tasks, and modernizing the employee service experience. - The Big Picture: Why are we all investing in HR? Today, modern, Customer Support teams use thoughtful, intuitive technology to solve customer issues at light speed. In some cases, they have even transformed from a cost center to a juiced up revenue producer. In our March Lunch and Learn our Customer Service experts will show how to do just that, with real-world examples from companies winning Customer Service right now, and a live demo. With the ServiceNow’s new Kingston release, fans will not only get new functionality for a richer user experience but enjoy important strides in perhaps the most anticipated areas area of the day: machine learning and automation.Every release brings us more expansion across the ServiceNow Platform, and Kingston is no exception, adding new features and functionality including advances in the ServiceNow Platform, CSM, HR Service Delivery, ITOM, ITBM, Performance Analytics, Security Operations, GRC, and, of course, IT Service Management (including Software Asset Management). Taken in context, these new capabilities make a strong case that ServiceNow is setting itself up to act as the technology backbone for modern organizations (so keep an eye out for future platform plays!). How Real-World Firms Transformed with Enterprise Service Management using ServiceNow. On Tuesday, January 30th, Join CEO, Ellen Daley, VP of Solutions and Innovation, Adam Mason, and Strategic Director of Marketing, Meghan Lockwood, to find out how to get the executive buy-in and prove your business case for Enterprise Service Management with ServiceNow. Learn what Forrester Research has to say about the Total Economic Impact of ServiceNow, find out how Acorio customers are reaping the benefits, and get you own exclusive pitch deck to help you win your business case. Our Experts Weigh In: What ServiceNow trends should you look for in 2018? On Tuesday, December 12th, 1:00 PM EST, 10:00 AM PST, join our panel of ServiceNow enthusiasts for a virtual roundtable as they share their predictions for where ServiceNow is going in 2018. The mandate to drive digital transformation has finally hit the realm of Higher Education, specifically targeting the “Ed Tech” universe. From the application process up until graduation, colleges and universities are dealing with a student body who have needs and demands that are very different from those of students who graduated even a decade ago. Think about it: the freshmen walking onto campus today have all grown up as consumers within an online community. They don’t just appreciate an intuitive, well-organized web experience, they expect one. ServiceNow aids schools in two ways: the platform makes it smarter, faster, and easier for students to navigate their student portals, and for universities to integrate and consolidate all of their disparate systems. With its intuitive interface, ServiceNow helps higher ed institutions to step away from the dark ages of spreadsheets and un-trackable requests, and instead provide their students and alums with an organized and pleasant web experience. 100% focused on ServiceNow, Acorio are a cloud consultancy on a mission: to inspire and guide leaders on their service management journey. A ServiceNow Gold Services Partner, we combine big company credibility with agility, innovation and a relentless focus on customer satisfaction.